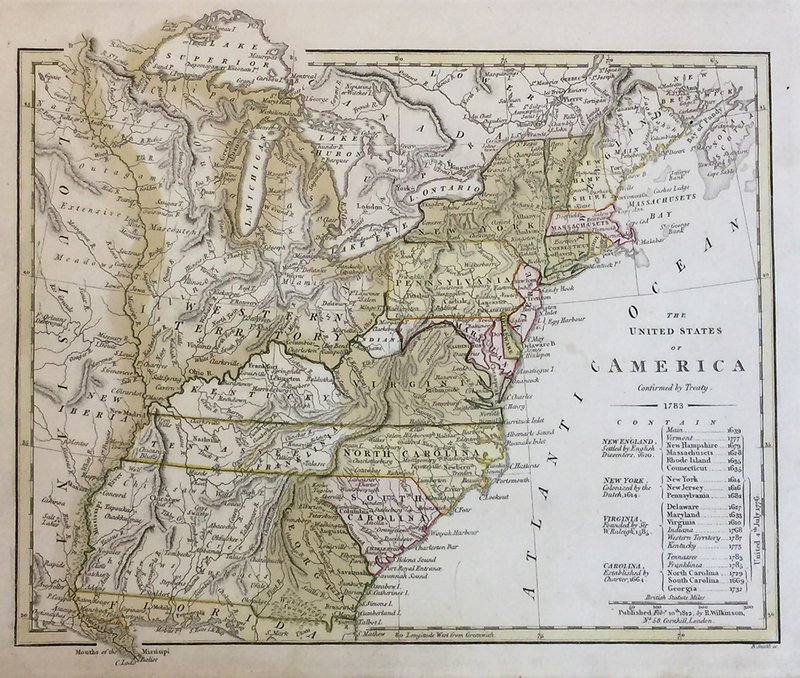 This blog post is the second in a series of three posts highlighting John Melish, a 19th century cartographer, and the impact his 1816 map, Map of the United States with the Contiguous British & Spanish Possessions, had on U.S. history. 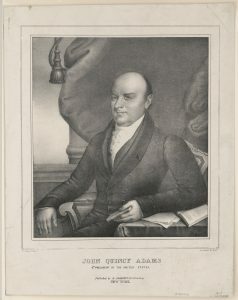 Popular Graphic Arts, Prints & Photographs Division, Library of Congress, LC-DIG-pga-10486. The Adams-Onís Treaty of 1819 was the culmination of prolonged boundary disputes between Spain and the United States. Spain was attempting to retain their colonial empire in the Americas which was crumbling at the hands of revolutionaries. The United States, on the other hand, was rapidly expanding its borders but was highly concerned about the British presence in Florida. Although officially recognized as Spanish territory, Florida was heavily influenced by British mercantilism. During the War of 1812, British naval vessels used Florida as a launching point for attacks on New Orleans and other ports of the American South. Moreover, the United States had growing concerns regarding the number of runaway slaves and Native Americans residing in Florida. For these reasons, both Spain and the United States sought a mutually beneficial compromise with Florida at the heart of the deal. The United States now claimed a solid, international boundary extending from the American South to the Pacific Northwest. 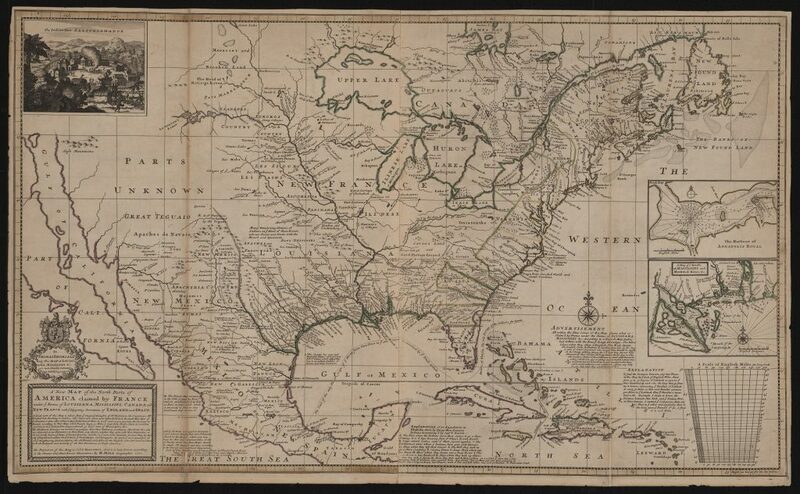 This blog post is the first in a series of three posts highlighting John Melish, a 19th century cartographer, and the impact his 1816 map, Map of the United States with the Contiguous British & Spanish Possessions, had on U.S. history. “Recalculating” is a term that many of us are far too familiar with. We hear it when the GPS navigation system on our phone is telling us how to get from Point A to Point B, but we somehow managed to miss the turn. 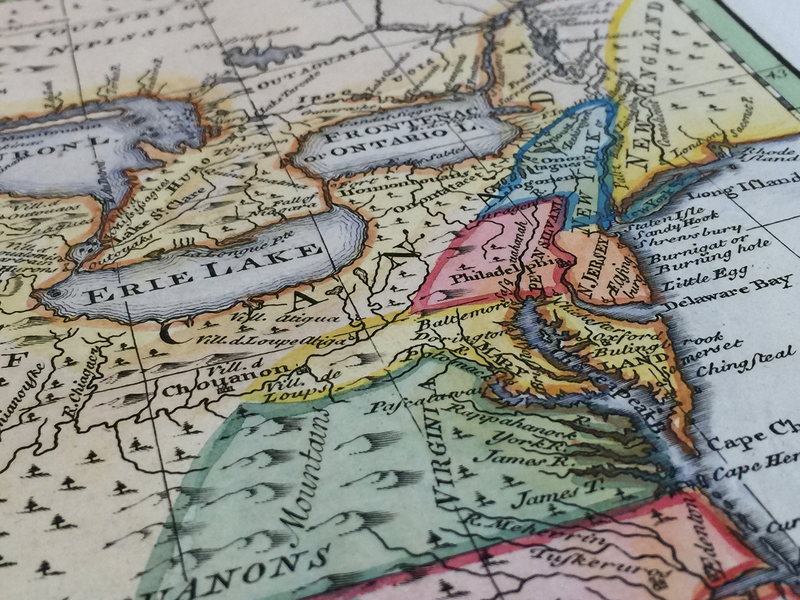 It is hard to imagine a time when maps were unable to give accurate directions in real time. Modern maps are expected to be flawless and up-to-date. So, what happens when maps are wrong? 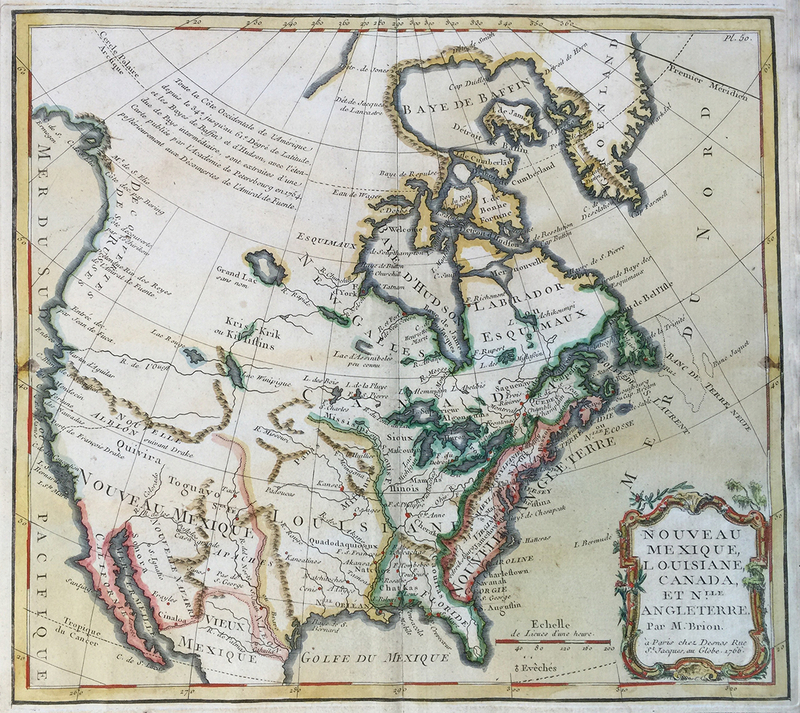 A New Map of the North Parts of America Claimed by France Under Ye Names of Louisiana, Mississippi, Canada, and New France with Ye Adjoyning Territories of England and Spain. 1720. Drawer 1 Folder 3, The Texas Collection, Baylor University. Map of the proposed layout for the town of New Birmingham. The streets were named after major U.S. cities, Texas towns, and a few of the major investors in the project. In the early 1880s, Alabama native and sewing machine salesman Alexander B. Blevins envisioned a town in East Texas that would rival the iron production of Birmingham in his home state. 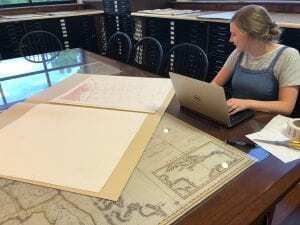 While traveling through the eastern part of Texas, he encountered significant iron ore deposits and identified a potential town site two miles east of Rusk, between Palestine and Nacogdoches. Blevins secured financial backing for “The Iron Queen of the Southwest” from his brother-in-law Gen. W. H. Hammon, a prominent Calvert lawyer, and several other wealthy investors from New York. 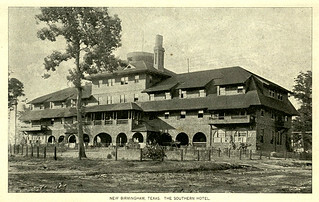 The town, called New Birmingham, sold its first lot in 1888 and by 1891 it boasted around 2,000 residents, two working furnaces, a train depot, electric light station, carriage shop, ice manufacturer, pipe and bottling works, brick yard, and the largest hotel outside of Dallas, San Antonio, Houston, and Galveston. Most of these buildings were built with brick, demonstrating the founders’ intention for the town’s permanence. 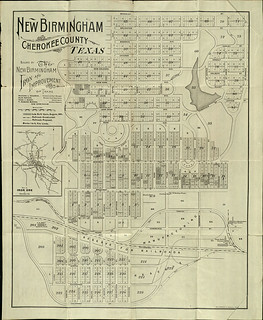 The Texas Collection recently discovered two pieces of promotional material associated with New Birmingham: a map of the proposed layout of the town along with existing homes and buildings as of August 1891 and a promotional booklet with details about the town’s benefits and business opportunities, which can be accessed here: here and here. Yet, by 1893, New Birmingham was deserted and the Cherokee County Banner, a local newspaper, declared that the “Iron Queen was dead.” All the town’s residents left except for a single caretaker and his wife who lived in the Southern Hotel, but even that structure burned to the ground in 1926. Most scholars point to a lack of initial capital for the venture compounded by the Panic of 1893, an explosion that ruined one of the furnaces, and the unfavorable Alien Land Act passed by Texas governor James Hogg as likely causes of the city’s quick demise. A legend survives, however, that tells a significantly different and more dramatic reason for the total destruction of New Birmingham, Texas. The most impressive structure in New Birmingham was the Southern Hotel. 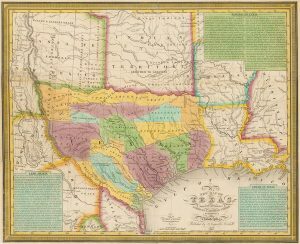 It housed such distinguished guests as Texas Governor James Hogg, railroad magnate Jay Gould, and former President Grover Cleveland. 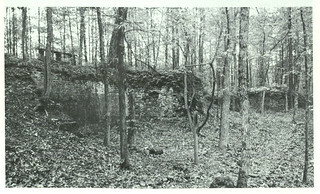 This photo shows a single brick wall from the high school, the only structure remaining from the town of New Birmingham. The rest of the site has been overgrown by the surrounding East Texas forest. Although the dramatic details of the legend cannot be proven, the slander suit and murder were reported in several Texas newspapers. The Galveston Daily News closely followed the trial and Cooney was found guilty of manslaughter and sentenced to two years in the state penitentiary on July 11, 1891. When the furnace exploded and the financial crisis hit New Birmingham in 1893, many townspeople recalled the curse of Mrs. Hammon and believed it to be a bad omen. Unlike other ghost towns in Texas, nothing remains to mark the place where this magnificent boomtown once stood. Most of the bricks from the businesses and homes were carted away during World War I or used to erect structures in the nearby town of Rusk. In a sense, Mrs. Hammon’s curse came true after all. “Gen. Hammon Killed.” Dallas Morning News. July 15, 1890. America’s Historical Newspapers, Readex. accessed June 14, 2017. Long, Christopher. “New Birmingham, Texas” A New Handbook of Texas. Vol. 4. Austin, TX: Texas State Historical Association, 1996. “Made It Manslaughter.” The Galveston Daily. July 11, 1891. Newspapers.com accessed June 14, 2017. “New Birmingham.” Cherokee County History. John Allen Templeton, ed. Jacksonville, TX: Cherokee County Historical Commission, 1986. New Birmingham Iron and Improvement Co. of Texas. New Birmingham, Cherokee County, Texas. Chicago: Rand, McNally, and Co., 1891. New Birmingham, Texas. Chicago: Rand, McNally, and Co., 1891. New Birmingham, Texas [Vertical File] The Texas Collection, Baylor University. Roach, Hattie Joplin. 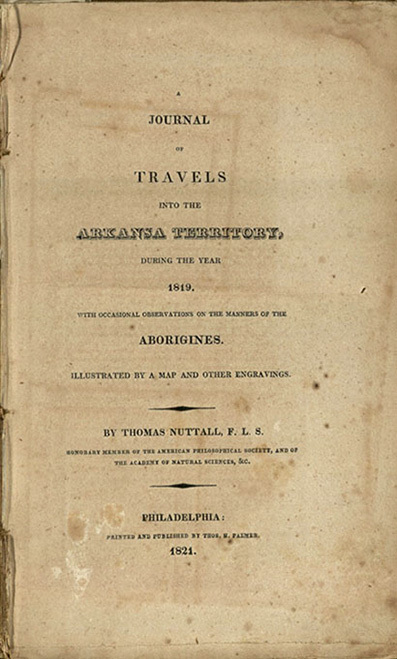 A History of Cherokee County. Dallas, TX: Southwest Press, 1934. 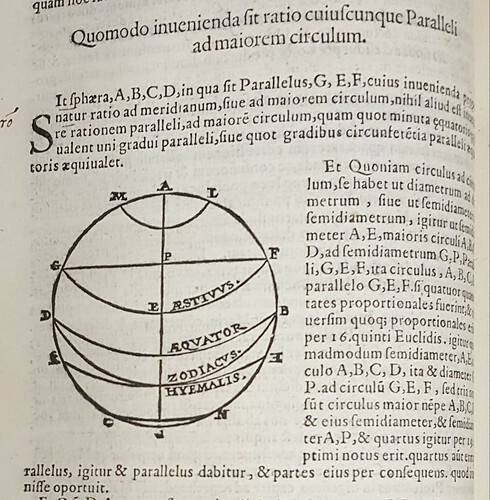 For this installment of Cataloger’s Corner, I’d like to share with you one of the oldest books held at The Texas Collection: a 1562 printing of Ptolemy’s Geographia. 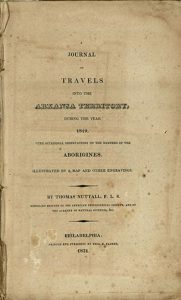 Not only is the book itself quite old, but it was acquired very early in the history of The Texas Collection through a unique program called the McGregor Plan for the Encouragement of Book Collecting by American College Libraries that operated during the 1930s. 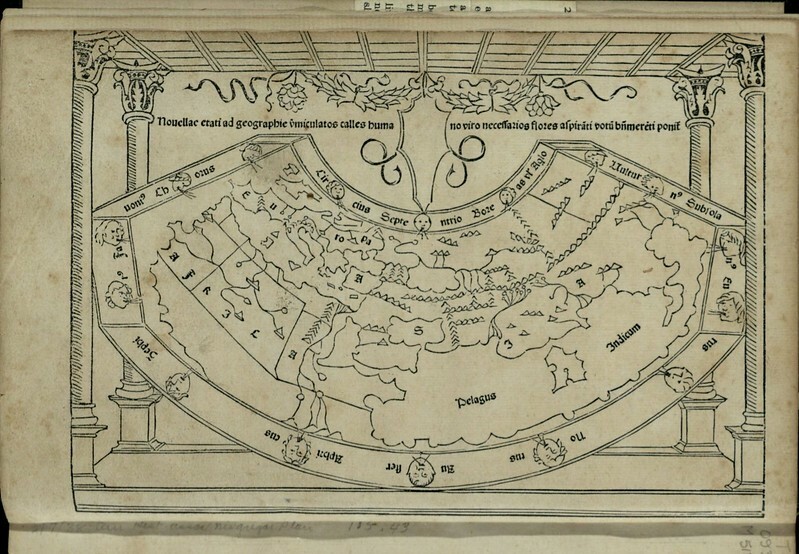 The Geographia, sometimes called the Cosmographia, is special for many reasons. 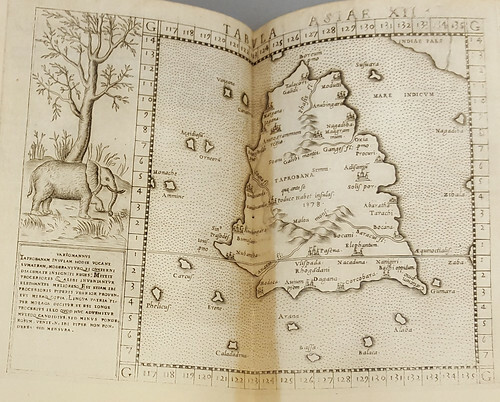 A revision of a now-lost atlas by Marinus of Tyre, it was compiled around 150 CE by Claudius Ptolemy using new principles and additional Roman and Persian sources. It was translated into Arabic in the 9th century and Latin in 1406, going through many editions in each language. 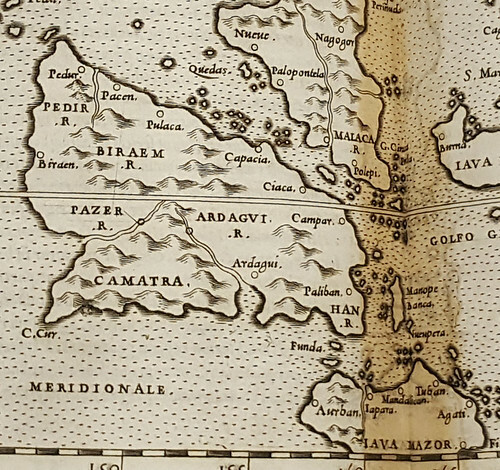 A large portion of Ptolemy’s work was dedicated to cartographic principles. Specifically, he improved the treatment of map projections—the system that lets cartographers map a round object like the globe onto a flat plane like a map—and gave readers instructions on how to recreate his maps. He also provided latitude and longitude coordinates for all the places and geographical features in the book. Of course, the ancient Romans were only aware of about a quarter of the globe; Ptolemy’s European maps didn’t include Scandinavia, for example, let alone North or South America. Later editions added additional maps to represent new knowledge. 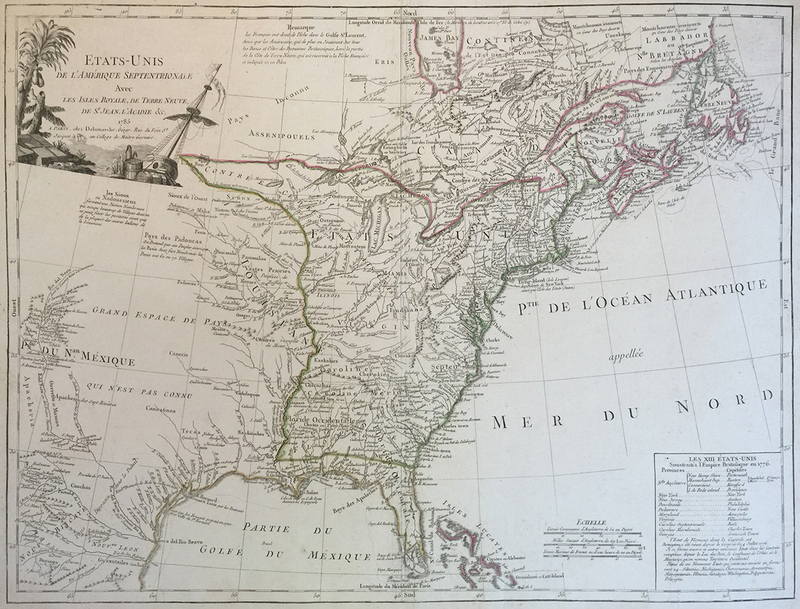 During the Age of Exploration, when Europeans launched extensive overseas exploration parties, new editions included as many as 64 regional maps. 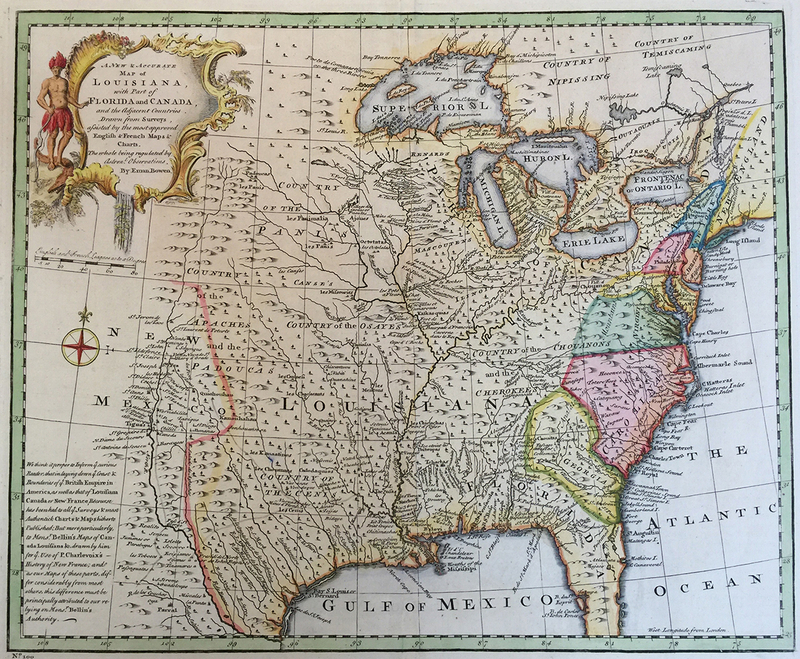 Old maps also had to be altered to reflect these discoveries. What I want to focus on here is one of the more curious geographical features mapped in the Geographia: the island of Taprobana. Don’t worry if that name doesn’t sound familiar: this place was known to the Greeks before the time of Alexander the Great, but modern scholars have no idea to what land it corresponds. On the map above, based on Ptolemy’s original world map, it is situated south of India and might represent Sri Lanka. 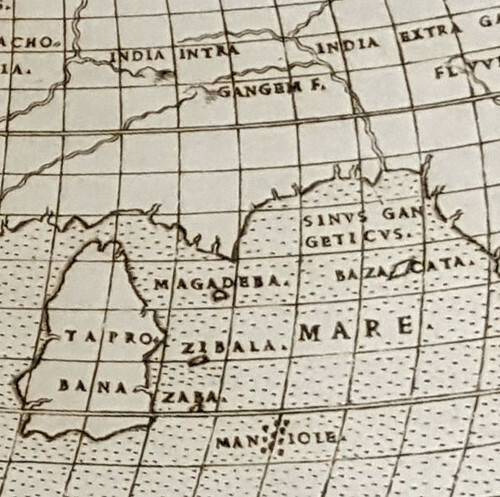 However, on the map to the left, which is based on geographical knowledge of the 1560s, Sri Lanka is clearly marked with a Z (Zeelan, a strange Latinization of the Portuguese Ceilão, from whence the English term Ceylon). Instead, the position of Taprobana might correlate with the island of Sumatra. But wait! A map of the area between the Adaman Sea and the Gulf of Thailand has Sumatra marked as Camatra. Below it is the island of Java (marked Iava, as Latin orthography often did not include the letter J). If Taprobana isn’t Sri Lanka or Sumatra, what is it? Some scholars think Taprobana is a phantom island, a geographical feature that shows up on maps for many years until subsequent explorations of the area fail to find the land mass. Others think the ancient Greeks and Romans simply miscalculated the location of Sri Lanka on their maps. They use linguistic evidence to bolster their argument: according to the Mahavamsa, a 5th century CE document written in the Pali language that chronicles the history of the kings of Sri Lanka, the legendary Prince Vijaya named the land Tambapanni (“copper-red hands” or “copper-red earth”) because his followers’ hands were reddened by the soil on the island. 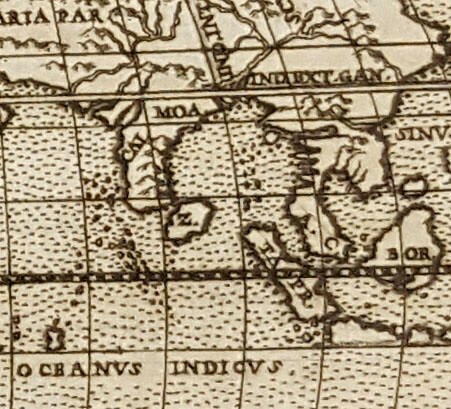 Perhaps later cartographers kept both Sri Lanka and Taprobana on their maps because they respected Ptolemy’s authority. Indeed, until the scientific revolution, previous scholarship was so revered that new discoveries which repudiated established fact were viewed with suspicion, or shoehorned into existing systems of thought even when there were obvious contradictions. Or, maybe the cartographers simply couldn’t rule out the existence of Taprobana and included it in their maps in case it was one day discovered. It remains a mystery. 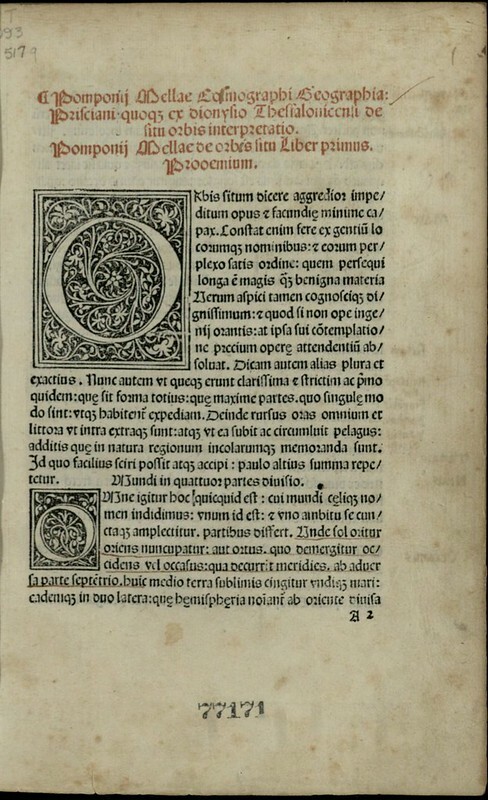 Baylor University holds other works by Ptolemy, which you can see here. If you’re interested in other early geographical works, click here. 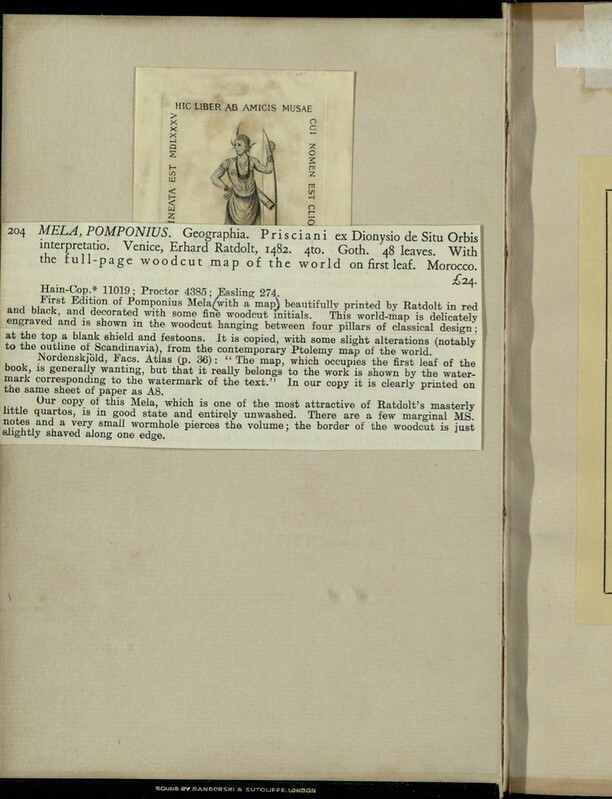 If you’d specifically like to see early atlases, follow this link.